Got Stinky Shoes? Time to Think & Act! Troubled with smelly shoes? Fear people around you might faint or run in horror the moment you slip them off? Before your shoes end up becoming a medium for mass destruction, learn about shoe smell and the causes behind it. Shoes, regardless of the type, brand, size or material, tend to become dirty and smelly in no time! Whether the odor comes from your feet or shoes, it is quite easy to control if you know how. The best technique to get shoe smell out is to know what causes the stink in the first place. Once this is known, implement the right solution to eliminate the problem. This will always help you keep your shoes odor-free so you will never have to worry about getting embarrassed again. The major cause of shoe odor is the bacteria present in sweat. Another culprit is the millions of cells that shed each day from your feet and deposit into shoes. Getting rid of the odor-causing bacteria and dead skin cells can ensure the desired results. It is crucial to make your feet stink-free to ensure better smelling shoes. So make sure your feet are properly washed and dried before you put your shoes on. Different types of antiperspirants available on the market will help with this. Another effective home remedy is to soak your feet in tea. Tea is rich in tannin, a drying agent, and effective at keeping feet dry and smelling fresh for a long time. Learn how to wash your shoes properly. Professional products like ODOREZE™ Natural Laundry Odor Eliminator Additive works well. Just add this to your washing detergent or pre-soak your shoes in it prior to washing to get the odor out. You can also use this deodorizer to wash any smelly clothing you might have. After washing, be sure to dry the shoes thoroughly in a tumble dryer or air dry. 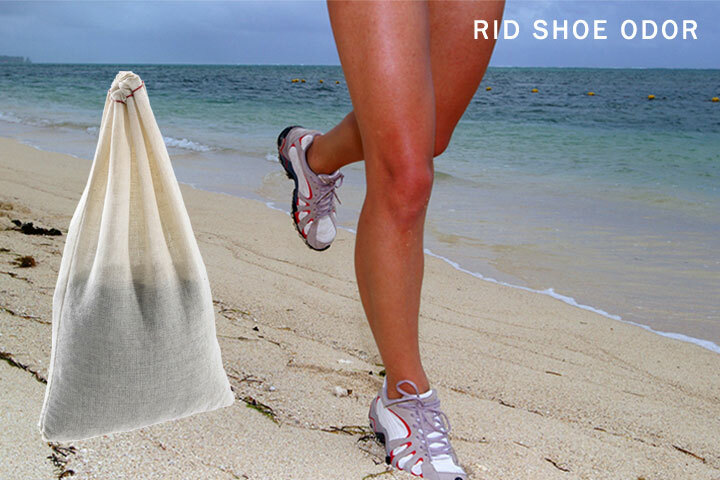 SMELLEZE™ Reusable Shoe Smell Removal Pouch can help you a lot to get the shoe smell out. All you have to do is simply insert a pouch in each shoe and leave it in until it’s time to wear them again. It will help in absorbing moisture and totally eliminate the bad odor from the shoes without using any harsh scents or chemicals. And since this deodorizer is reusable, it will last for years to save you money. SMELLEZE™ Natural Shoe Odor Eliminator Powder is also a very powerful deodorizer that removes bad shoe smell. Just sprinkle a little on the inside of the shoes and allow it to stay in until it’s time to wear them again. Then simply shake off the powder before using the shoes again. You will be amazed at how well this works because you won’t smell anything after this treatment! You can consider regularly disinfecting and air drying your shoes to prevent the horrible shoe odor from coming back. To disinfect, use a cotton ball and pour some alcohol or hydrogen peroxide on it. Wipe the insides of shoes with the soaked cotton ball and store until you are ready to reuse. This might sound bizarre, but you can also leave your sneakers in the freezers overnight. The cold freezing temperature will kill the bacteria and thereby disinfect your shoes from the odor-causing bacteria. This is not recommended for leather shoes as they could get damaged in the freezer. Lastly, allow your shoes to air out regularly for the night after you wear them. Better still, leave them out in the sun for a few hours whenever possible. The fresh air and UV light from the sun will do them good! It’s also helpful not to wear the same shoes every day. Give your shoes a break by changing them periodically and it will reduce the odor build-up.